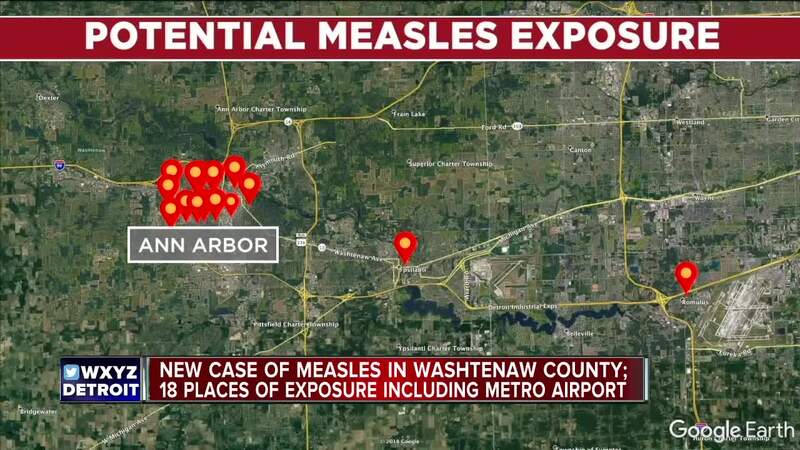 The Michigan Department of Health and Human Services and the Washtenaw County Health Department say they have confirmed a new case of the measles that is unrelated to the 39 cases previously identified in Michigan. Officials say this new case is related to international travel and they are alerting to public to potential exposure sites. 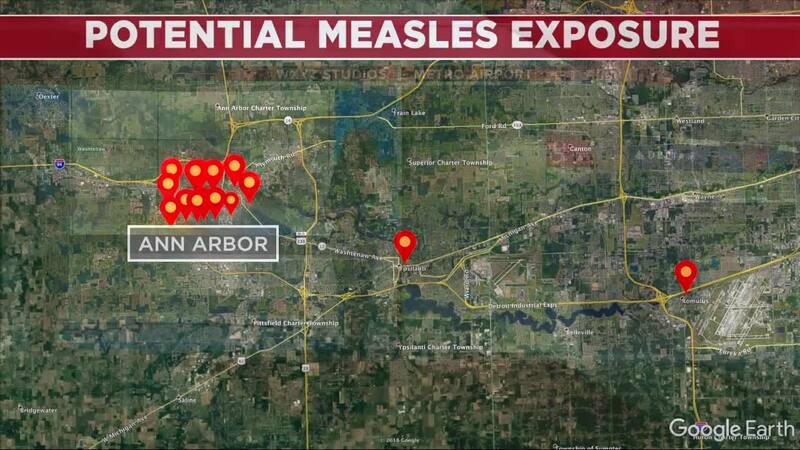 ANN ARBOR, Mich. (WXYZ) — The Michigan Department of Health and Human Services and the Washtenaw County Health Department say they have confirmed a new case of the measles that is unrelated to the 39 cases previously identified in Michigan. Officials say this new case is related to international travel and they are alerting to public to potential exposure sites. University of Michigan Intramural Sports Building, 606 E Hoover Avenue, Ann Arbor on April 1, 11 a.m. to 3 p.m., April 3, 10 a.m. to 2 p.m., and April 4, 4 to 7 p.m.
Lucky’s Market, 1919 S Industrial Highway, Ann Arbor on April 1, 1 to 4 p.m. and April 6, 1:30 to 4:30 p.m.
University of Michigan North Quad Complex, 105 S State Street, Ann Arbor on April 3 from 8:30 to 11:30 a.m.
NeoPapalis, 500 E William Street, Ann Arbor, April 3, 9 to 11 p.m.
Encore Records, 417 E Liberty Street, Ann Arbor on April 4, Noon to 3 p.m.
University of Michigan Angell Hall Courtyard Computing Site (a.k.a. The Fishbowl), 435 State Street, Ann Arbor on April 4, 1 to 6 p.m. and April 5, 4 to 10:30 p.m.
Jolly Pumpkin Café & Brewery, 311 S Main Street, Ann Arbor on April 5, 12:30 to 4:30 p.m.
CVS Pharmacy, 209 S State Street, Ann Arbor from April 5 at 9:30 p.m. to April 6 at Midnight. CVS Pharmacy, 1700 S Industrial Highway, Ann Arbor on April 6, 10 a.m. to Noon. Woodbury Gardens Apartments leasing office and clubhouse, 1245 Astor Avenue, Ann Arbor on April 6, 11 a.m. to 1:30 p.m.
Michigan Flyer-AirRide bus on April 6, 3:15 to 6 p.m.
DTW Airport McNamara Terminal on April 6, 3:55 to 7:30 p.m.
Everyone potentially exposed at the above sites is already outside of the time period for the MMR to prevent infection in unvaccinated, exposed individuals (72 hours). However, all Michiganders are encouraged to check and update their measles vaccination. The MMR vaccine is available through primary health care providers and at some local pharmacies. Individuals with insurance should contact their health care providers for vaccination. Washtenaw County Health Department can provide vaccine to individuals with Medicaid, Blue Cross Blue Shield of Michigan insurance or who are uninsured or underinsured. For others, fees may apply.Washtenaw County Health Department is offering the MMR vaccine at a walk-in clinic on April 12, until 7 p.m. at 555 Towner Street in Ypsilanti. Or, call 734-544-6700 to schedule an appointment.